It feels like time has flown since last Monday. During the week, I went to a high school volleyball game, played some sports with friends, and prepared for my last weekend of exploring here in Arizona. I saved Phoenix for my last weekend of adventures hoping it might be a little cooler which definitely didn’t happen. I had forgotten about it being Labor Day weekend until a few weeks ago, and several things about waiting until this weekend worked out really well, even if it was still ridiculously hot. I also decided that since I had been keeping a pretty full schedule every other weekend that I wanted to have a bit more of a relaxed weekend (it may not seem like I really relaxed, but I promise there was plenty of downtime spent watching college football this weekend). I got to Phoenix on Friday evening and started sightseeing pretty much immediately. Since it was the first Friday of the month, the Heard Museum offered free admission from 6-10pm. I still had to pay for the special exhibit, but paying just $7 instead of $25 to see the museum and special exhibit was a bargain I couldn’t pass up. The special exhibit was Diego Rivera and Frida Kahlo. The collection included pieces from both artists as well as photos of them and clothing from Frida. Bits of history and narrative were also included between paintings as you walk through the exhibit. It was really neat getting to see so many paintings and photos up close and in real life that I learned so much about during school. It was humbling to be so close to these masterpieces that people from all over the world study and see in textbooks every day. The heard museum also had several really neat exhibits as part of their permanent collections. There were lots of pieces from native artists, and each tribe represented had its own feel in the art represented. There were also several powerful pieces about the native perception of the missions and efforts to erase their culture. I think my favorite exhibit though was the Indian Boarding Schools exhibit. It was a chilling exhibit to go through and to read different quotes and see such a dark part of our history. The cruelty of the boarding schools is overwhelmingly a part of the history of so many. Throughout the exhibit, there were also many examples of resilience and beauty continuing to thrive. Overall, the exhibit was heavy and somber, but I really learned a lot. I am glad that the history wasn’t glossed over or ignored because it really allowed me to think about how we have treated people in the past and how we need to keep striving to be better in the future. Saturday morning, I went to the Arizona Science Center (sidenote: when planning what I wanted to do in Phoenix, I once again remembered how awesome having free museums in St. Louis is. Everywhere is so expensive in Phoenix!). I found a groupon, so it only cost me $13 to get into the science center and special exhibit instead of $26. The science center was pretty neat and very interactive. There were exhibits on construction, energy, the body, weather, and more. The special exhibit was called Get Animated and was all about the animation. I was pretty excited because while a lot of the other exhibits are similar to most other science centers, this was something I hadn’t seen before. The exhibit had information on the history of animation all the way back to the early 1900s as well as parts about creation and production. It was really neat to see some of the groundbreaking characters throughout animation history from Gertie the Dinosaur to Mickey Mouse to Gumby. There were lots of sketches and clay models from various films and tv shows. Gumby was a much bigger part of the exhibit than I expected, but there was a really neat web showing the influence Gumby and his creator Art Clokey had on other animators (Pixar, Nightmare Before Christmas, Coraline, Dinosaur, and many more all have ties to Gumby). I was a little disappointed that there was more on Pixar since they were such a game changer for computer animation, but overall it was still a pretty cool exhibit. After the Science Museum, I took it pretty easy until the evening. I went to the Torch Theatre for some improv Saturday evening. The theater is pretty small, and the sign to find it is overshadowed by the huge sign for the massage shop upstairs, but the people were so friendly and the shows were great. The first show was an open jam, so I actually ended up playing, and the coaches and atmosphere were so positive and welcoming that it didn’t even feel like I was an out of towner. The second show was a longform show, and it was enjoyable and funny throughout. I have really enjoyed getting to see shows in different places and see how wonderful the communities and theaters are in different places. Since Labor Day brought with it a 3-day weekend, on Sunday, I ventured down to Saguaro National Park. I didn’t think I would have time on a 2-day weekend since it is about an hour and a half from Phoenix and I didn’t want to spend my whole time visiting Phoenix not it Phoenix, but with the extra day I made the trip. Saguaro National Park is split into 2 parks separated by the city of Tucson. I started out at the East or Rincon part of the park. The East is the larger of the 2 areas and has a ton of trails throughout it. There is an 8 mile paved loop drive through the park with overlooks and trailheads along the way. I did part of the Mica Trail, and the Ecology Trail. The Mica trail is the starting trail from the Mica overlook and connects with a bunch of other trails. It provided a nice opportunity to look at some of the Saguaros, but most of the larger Saguaros were still pretty far off the trail. I didn’t walk very far along the trail because it was hot, and it wasn’t super close to a ton of cacti. The Ecology trail was neat because it showed a ton of diversity in the plant life of the park. 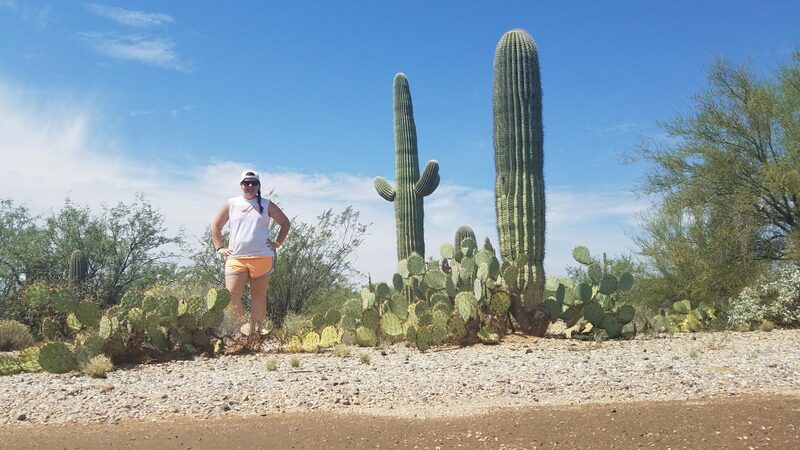 I hadn’t really thought of the park as having so many different kinds of cacti and other plants, and it was amazing to see all of the different plants that were thriving in the desert. After visiting the East park, I drove through Tucson and stopped at the Desert Museum a few miles before the West park on a recommendation from one of the rangers. The museum is much more of a zoo and botanical garden than a museum, but it was really neat. The museum celebrates the plants and animals found in the Sonoran Desert which spans across parts of Mexico and the Southwestern United States. It was $23 for admission to the museum and to stingray touch. The museum is huge and is mostly outside. I wanted to make sure I still had time to explore at the West Saguaro Park, so I looked at the map and tried to decide what I most wanted to see. Since I had paid for the Stingray Touch, I decided to start there. The Stingray Touch was a pool with 21 stingrays that you could stick your hands in and touch. The stingrays are in the desert museum since the Sonoran Desert surrounds the Gulf of California, and the gulf’s plants and animals are important to the desert too. There weren’t too many people at the touch pool, and it was pretty calm and relaxed. It was really neat getting to touch the stingrays and just watch them swimming around. After the stingrays, I saw a few other animals along the way to Cat Canyon. The cats’ area was built into a canyon area, and you could peer in through the top to try and look at the cats. There was also a large section below with big windows into the different canyon enclosures. Some of the den like areas in the rock also had windows in to them, and I did get to see an ocelot napping in his den which was pretty cool. I walked along a few more of the trails and visited the cave section and the reptile house before heading out. The desert museum was definitely a neat look at life in the Sonoran Desert. After the desert museum, I made my way to the West part of Saguaro National Park. The West park is smaller and maybe a little harder to navigated, but I also found it to have better views and have trails that were closer to more cacti. The park has a 7 mile unpaved loop trail, as well as another unpaved road that turns off of the loop and cuts through the park that we will get to later. There is a short, paved Desert Discovery walking trail just before the loop. The trail runs right next to tons of Saguaro and other cacti (I think my favorite were actually the cacti with the orange flowers on top). It offered more spectacular views of the cacti than I had gotten anywhere in the East park, and I had high hopes for the rest of the park. The dirt loop road through the park was much closer to the cacti than the East loop had been, and every stop had amazing views. I had planned on going to the Signal Hill trail to see some petroglyphs in the park as I went along the park loop, but I took a wrong turn and the weekend ended a little differently than I had planned. Remember that unpaved road I mentioned that turned off of the loop trail? I accidentally turned onto that road instead of continuing on the loop. It took me a few miles before I realized I had made a wrong turn, and by the time I realized the road wasn’t really wide enough to turn around. I looked for a spot to turn around and I finally found one. On the way back towards the loop, my ball joint and axle on my car snapped and I was stranded. Luckily, I had cell phone service and was able to call the rangers station to make sure someone knew I was out there. I called for a tow after I called the rangers station, and after about 2 hours I was headed back to Phoenix in the tow truck. The rangers, people who drove by while I was stranded, and the tow truck drivers were all very nice. I looked up a few shops when I got back to Phoenix, but I really wasn’t having much luck finding anything out, so I went to bed and decided to figure it out in the morning. Monday morning, I spent a few hours trying to find a shop that was open on Labor Day to get my car fixed with no luck. The repairs would have to wait until Tuesday, so I made an appointment for Tuesday morning, bought a bus pass, and decided to try and still enjoy the day. I decided to go to the zoo. Zoo admission was discounted because the zoo is under construction so it only cost $20 to get in. The zoo is pretty big, but when it’s ridiculously hot big isn’t necessarily enjoyable. There were a few areas that I thought were really neat. The Forest of Uco section really focused on where several South American animals live, and how we can help conservation efforts for these species and their habitats. I also really enjoyed monkey village. Monkey village is an exhibit where you go into the enclosure with squirrel monkeys, and get to see them without barriers between you. It was neat to get to hang out in the space with the monkeys. The monkeys don’t really interact or react to people being in the exhibit, but it was still really neat to get to see them up close. The construction in the zoo cut off part of the circle through the Africa trail. This meant that you had to walk ¾ of the way around the loop and then return the same way since the loop no longer connected on the other side. Since it was so hot, I decided to skip the African animals and finish my zoo trip. Right next to the zoo was another attraction that had been on my list, Hole in the Rock. Hole in the Rock is a natural formation where there is a hole that you can walk through, and there is a nice overlook of the area as well. The trail up to hole in the rock was pretty short and easy with rock steps along a lot of it. The hole in the rock looked so different from the below than it did from the top which was really cool as well. From below the hole looks huge because there is all this space that is open in front of the hole. At the top, the hole looks much smaller, and it becomes obvious that the area in front is more of a landing or shelter area. Seeing both perspectives was really cool. It was also neat to see the view of the city from the hole in the rock. I had thought that seeing the hole in the rock would be the only spectacular view, but stepping through and seeing the city below and the mountains in the distance was just as rewarding. Monday afternoon, I just wanted to relax and cool off. I decided to go to a movie to stay cool and relax. I saw Cars 3, and I really enjoyed it (way better than Cars 2). I got back from the movie, had dinner, and went to bed early so I could wake up early to deal with my car. Tuesday morning, I went to the auto shop bright and early to get the repairs underway. First, I had to get the car to the auto shop, and the tow took about an hour. Once the shop had the car, it took about an hour or so before they had an estimate for when it would be done. They told me probably close to 2-3 that afternoon, and I decided to walk around for a little bit instead of just hanging out at the shop. I tried to go to the children’s museum since it was in the top 5 attractions for the area, but a child is required for admission so I couldn’t. I went to a coffee shop and got a cold drink, and I looked for things to do in the area. There wasn’t really anything super close that I was interested in, so I decided to head back to the shop. It was almost lunchtime, so I stopped for food on the way back, and then I headed back to wait. Once they got the axle fixed and the car at least moving, they realized there was another much smaller problem with the bearing. They fixed that problem as well, and I finally had my car back around 5pm. Travel doesn’t always go as planned, and I’ve learned that being flexible and adaptable are 2 of the most important parts of having a successful travel experience. Just because things don’t go as you wanted, doesn’t mean they can’t still turn out great.